Boarding takes place at our 17,500 square foot daycare facility. Dogs stay in groups 24/7 and have the freedom to mingle and play or sleep, inside or out, day and night. This is an alternative to traditional dog kennels where dogs are typically kenneled alone for much of the day and night. As opposed to pet sitting, where your pet may only get an hour or two of human attention each day, your dog will enjoy canine and human contact throughout their stay. 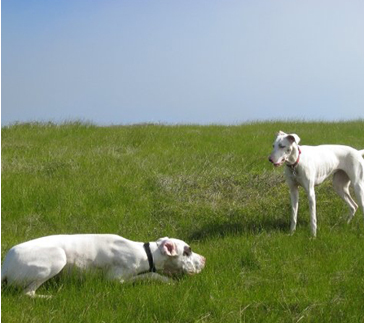 Boarding dogs have the option to stay in our daycare facility or go out on our dog hikes during the day. After dinner, evening cuddles and a final “pee break”, we put out pads and blankets in our cots and open crates, turn on the “quiet time music” and each dog picks a spot to bed down for the night. Attend 2 days of daycare or hiking prior to the first overnight. It is our experience that dogs who get to come and play and get picked up by mom or dad at the end of the day, experience less stress during their overnight stays than dogs who have not had the opportunity to associate Smilin Dogs as a friendly and temporary place that mom or dad will return to. In order to hike during a boarding stay, your dog must have hiked with us previously. We have staff on site 24/7 to ensure the safety of your dog. Please do not bring bowls, beds, toys, food scoops or crates. We have plenty of everything and because your dog will be in with a group, we can’t protect personal belongings. We use crates for safety at feeding time. Please send your dogs’ food and feeding instructions. We cannot provide “open feeding” due to the group nature of our playrooms. We recommend overestimating food quantity as your dog will generally use more energy here than at home. We require boarding dogs to be dropped off by 2pm on their first day of boarding so they can get used to our environment and get some exercise before it’s bedtime. Dogs picked up after 10 AM at the end of a boarding stay will be charged a daycare charge for that day. Chauffeur service is offered for boarding stays, however for the safety of your dog, we recommend that you be home for pickup and drop-off. If you can’t be home, we recommend picking up and dropping off at our facility in San Carlos. Although the vast majority of our hiking and daycare dogs are also approved for boarding, we cannot guarantee approval in all cases. In particular, if we feel that your pup is extremely uncomfortable or would be overly disruptive to the other dogs, we may only permit daycare or hiking until s/he is sufficiently comfortable.